Vol. XXV. Geneva, Wednesday, Jan. 1, 1834. No. 31. THE MORMONITES. -- There is no religion, or rather form of religion There is no religion or rather form of religion, no creed or system of politics, that will not find its advocates. A friend from the upper part of Oxford County informs us, that one Mormon preacher from Ohio, and another from New Hampshire, reinforced by a pair of preachers from Saco, have been making a great stir somewhere about Lake Umbagog. Nearly the whole of the Freewill Baptist Church, numbering thirty persons, with their pastor, have gone over to the Mormonites, and avowed their faith in the book of Mormon. -- The have all been re-baptized in the waters of the Lake. In Andover, the preachers have had some trouble with the citizens, and were rather unceremoniously dismissed. -- Portland Daily Adv. Vol. XXV. Geneva, Wednesday, Jan. 8, 1834. No. 32. THE MORMON WAR. -- The Fayette (Miso.) Monitor gives the particulars of the late disturbances between the Mormonites and the citizens of Jackson county. It appears the Mormons, about 70 in number, killed two and wounded several others of a party of 17 citizens, who visited their settlement for the purpose of making arrangements in relation to their covenant to leave the county. After the first fire, which was ineffectual, Mr. Brazeale ascended an eminance, and proclaimed peace -- with these words in his mouth he was shot. The conflict then became general, and the citizens were driven off. Preparations were then made by both parties for an extermining conflict, which was prevented by an order from the governor, that induced the Mormons to ground their arms and leave the county. A letter from the Rev. B. Pixley, to the editor of the New-York Observer, states, that the Mormons proclaimed that the spot they had selected was the Zion spoken of in scripture -- that the present inhabitants would be driven off, and they, the Mormons should inhabit the country. In their doctrine, they proclaimed as an inheritance the whole of Jackson county, and by fraudulent and false statements had gathered together the scum of the earth, and offered inducements to free negroes every where to join them. The editor of the Monitor repels the accusation that the people of Jackson county are inclined to turbulence. -- Saratoga Sentinel. Vol. XI. Palmyra, N. Y., Friday, January 31, 1834. No. 20. The Mormons. -- A letter from Kirtland, Ohio, to a gentleman of this village, dated the 7th inst. states that the Mormons at that place, with Jo. Smith at their head, are "arming themselves with guns, swords, dirks, large knives, and other implements of warefare," and that the neighborhood is thrown into a state of great alarm. A newspaper has been established there by them, entitled the "Evening and Morning Star" -- or rather it is a resuscitation of the concern formerly established at their quarters in Missouri, and demolished in the late affray at that place. Note: This message from Kirtland may have been a follow-up letter by the same Josiah Jones who wrote from Kirtland to Palmyra, and whose letter was summarized in the Sentinel of Dec. 6th. The excerpt from the unidentified correspondent does not say whether the "state of great alarm" at Kirtland was more due to the Mormons' recent losses in Missouri, or to perceived dangers locally. D. P. Hurlburt was either at his pre-trail hearing in Painesville, or had just been bound over by the justice court at the time the letter was written in Kirtland; so it seems unlikely that he was in a position to lead any organized hostilities against the Mormons at this time. Possibly some minor skirmishes were conducted by Joseph H. Wakefield and his friends against the Kirtland Saints. It is also possible that Joseph Smith, Jr. induced some limited hysteria among his followers in order to better consolidate his position as their leader. Vol. XXV. Geneva, Wednesday, Feb. 12, 1834. No. 37. THE MORMONS. -- A letter from Kirtland, Ohio, to a gentleman of this village, dated the 7th inst. states that the Mormons at that place, with Jo. Smith at their head, are "arming themselves with guns, swords, dirks, large knives, and other implements of warefare," and that the neighborhood is thrown into a state of great alarm. A newspaper has been established there by them, entitled the "Evening and Morning Star" -- or rather it is a resuscitation of the concern formerly established at their quarters in Missouri, and demolished in the late affray at that place. -- Wayne Sentinel. Vol. XI. - No. 30. Palmyra, N. Y., Fri., Apr. 11, 1834. Whole 550. MARTIN HARRIS. requests us to say, that on Sunday afternoon next, at 4 o'clock, at the stone school house in this village, he will explain the 12th chapter of Daniel. Note: Martin Harris temporarily left Ohio, after being brought before the Kirtland Council on charges that could have resulted in his excommunication. Perhaps he was in temporary "exile" from the Mormon capital at this point in time. A few days after this notice was published he returned to Kirtland, to join the "Zion's Camp" military expedition against the Gentiles of Jackson Co., Missouri. N.S. No. 37. - Vol. II. Canandaigua, Weds., May 14, 1834. No. 342. Mormonism in Court. We learn from the Spectator, a paper published at Chardon, Geauga county, Ohio, that a curious trial revently took place in that county, in which Joe Smith, the founder of mormonism and Dr. P. Hurlbut, were the parties. The complaint was made, before a justice of the peace to bind Hurlbut to keep the peace towards the prophet. The justice ordered Hurlbut to enter into bonds, and on monday the 8th inst. the cause was heard before the court. The court-house was filled almost to suffocation, with an eager and curious crowd of spectators, to hear the mormon trial, as it was called. A great number of witnesses attended, and were examined, chiefly members of the mormon society, among whom was the renowned orophet himself. It appeared that Hurlbut had been a disciple of mormonism, and was ordained an elder by Joe himself, but for misconduct, as the mormon witnesses alleged, was excommunicated. After this he discovered that Joe was a false prophet, and the book of Mormon a cheat: -- began lecturing against it, and examining and collecting proof that the story of the book of Mormon was taken from a manuscript romance, written by one Spalding, who formerly lived at Conneaut, and who died before publication. Many witnesses testified to threats of revenge from Hurlbut. One witness, who testified to the threats of Hurlbut, on cross-examination being asked the reason why she had not communicated these threats to Smith, answered that she did not believe Hurlbut, or any other human being, had the power to hurt the prophet; but Joe himself appears to have placed little reliance upon his divine invulnerability; for he testified that he became afraid of bodily injury from the defendant. The court finally ordered Hurlburt to find security in the sum of two hundred dollars, and to keep the peace for the period of six months. Vol. IV. Lyons, N. Y., Wed., May 14, 1834. No. 33. TRAGIC EVENT. -- The following tragical story of a Mormon preacher is given by the editor of the Independent Messenger on the authority of a gentleman from the western part of the state of New York. In a town where the Mormon delusion had made numerous converts, the disciples were summoned to assemble in a wild place, circumjacent to a pond, on the water of which the gifted elder anounced that he should walk and preach. The believers notified their doubting friends, and great things were anticipated. But it seems there were a few wicked Lamanites, who secretly set themselves to make mischief. Choosing their opportunity just before the appointed day of miracles, they ascertained by means of a raft, that the pond to be traversed was extremely shallow; a thin sheet of water covering a common swamp mire. This mire was found to be of a consistency nearly strong enough, except within a small central space, to sustain the weight of a man. They soon discovered a line of plank laid in a particular direction completely across the pond, sunk about four inches under the surface of the water. -- These were so fastened down, and locked together, and so daubed with mud, as to be quite imperceptible from the neighboring declivities. They resolved on preventing the miracle by sawing the concealed bridge in pieces, just where it crossed the deepest and most dangerous part of the pond. This was done, and left seemingly as they found it. The expected day arrived, the congregation placed themselves as in an amphitheatre on the surrounding slopes and the preacher appeared at the edge of the water. Presently he raised his stentorian voice and as he paced his invisible bridge with a step apparent unearthly taught and warned the people. All ears were open, and every eye strained from its socket with astonishment. But alas! just as the miracle-worker seemed to have wrought conviction of his divine power in the wondering hearts of the multitude, he stepped upon one of the detached pieces of plank, sallied side-ways, and instantly plunged, floundering and sinking in the watery mire. The mingling shrieks, screams and shouts of the spectators, all in a rush of commotion were appalling. The scene was indescribable. Even those who had spoiled the miracle, were filled with horror when they actually saw the unfortunate impostor disappear. They had not dreamed that their trick would cost him more than the fright, discomfort and disgrace of being submersed and afterwards struggling ashore; all along taking it for granted that his plank would enable him to swim, however it might treacherously fail him to walk. But the tale closes with the close of his life and the consequent close of Mormonism in that vicinity. He sunk, and long before the confounded assembly were in a condition to afford him relief, perished, a victim to his imposture. Note: Compare this dubious report to the almost identical article previously published in the Philadelphia Saturday Courier of April 19, 1834 and also to the article in the Christian Standard of Sep 29, 1906. The Rev. Robert B. Neal wrote an interesting article on the same topic for his Sword of Laban Leaflets, series two, leaflet no. 17. Vol. XI. - No. 37. Palmyra, N. Y., Fri., May 30, 1834. Whole 557. According to a late number of the Painesville Telegraph, General Joe Smith, the leader of the Mormonites, has, accompanied by about five hundred of his followers, set out for the purpose of re-conquering the "Holy Land," lately taken from them by the infidels of Missouri. Joe, it seems, had been stirring up his proselytes for some time, stating that it was the command of God that they should buckle on the armor of their faith, and enrol under the banners of Mormonism; that their church was in danger; and that they must, if necessary, die the death of martyrdom. Accordingly, the deluded fanatics obeyed his summons, a great rise took place in the market for warlike implements, as each provided himself with an abundant supply of pistols, dirks, swords, &c. The sword of Smith himself, it is said, is more than four feet long. The prophet professes the expectation of sharing the fate of a martyr at the coming contest. We trust that the good people of Missouri will take care of these fanatics, and see that they do not violate the laws with impunity. -- Rochester Democrat. Vol. XI. - No. 39. Palmyra, N. Y., Fri., June 13, 1834. Whole 559. Richmond, (Wayne Co. Indiana,) May 24. Mormonites. -- On Monday morning last, a caravan of about two hundred Mormonites, with a long train of wagons, passed through this place, on their way to the "far west." There were but few women among them, and the men were generally, if not all, supplied with fire arms. A stout, hardy set of looking fellows they were too, and many of them quite intelligent. From their equipment, it has been suspected that they intend joining and defending their brethren in Jackson county, Missouri. They professed to be in search of new lands, whereon to form a settlement, either in Illinois or farther west. We understand they were from the States of Vermont, New York, and Pennsylvania, and had assembled at some point on their route hither. Palladium. Vol. XI. Palmyra, N. Y., Friday, July 18, 1834. No. 44. The Mormons. -- Western papers state that the worst apprehensions of their citizens, it is feared will be realized, by the determination of the Mormons to return to Jackson county, Missouri, from which place they were ejected about a year ago by the citizens of that county. The Mormonites have refused all overtures from the citizens, and have expressed their determination to "regain their Holy Land or die with the sword in hand; and the citizens of Jackson county, have resolved that they will "dispute every inch of ground, burn every blade of grass, and suffer their bones to bleach on their hills, rather than the Mormons should return to Jackson county." "It is a lamentable fact, (says the Missouri Enquirer) that this matter is about to involve the whole upper country in civil war and bloodshed. We cannot (if a compromise is not agreed to before Saturday next) tell how long it will be before we shall have the painful task of recording the awful realities of an exterminating war." A MORMON BATTLE. -- A letter has been received, by a gentleman in this neighborhood, direct from Missouri, stating that a body of well armed Mormons, lead on by their great prophet, Joe Smith, lately attempted to cross the river into Jackson county. A party of the citizens of Jackson county opposed their crossing, and a battle ensued, in which, Joe Smith was wounded in the leg, and the Mormons obliged to retreat: that Joe Smith's limb was amputated, but he died three days after the operation. -- Chardon Spectator. Vol. IV. Lyons, N. Y., Wed., July 30, 1834. No. 44. Joe Smith, the great prophet of the mormons, was wounded in the leg, in a battle between him and his followers, and a party of the citizens of Jackson county. The mormons were obliged to retreat and it is said, -- that Joe Smith's limb was amputated, but he died a few days after the operation. Vol. XI. Palmyra, N. Y., Friday, August 1, 1834. No. 46. THE MORMONS -- A particular account of the last Mormon campaign in Missouri, is given in the Western papers. The belligerents seem to have been mutually exasperated, and to have approached very near to a general and bloody battle. The numbers engaged in the contest on both sides are much larger than we had supposed, before seeing these authentic details. The Mormons assembled late in June, in Clay county, (Mo.) and were reinforced by parties principally from Ohio, until they mustered from 800 to 1000 mean, armed with "guns, tomahawks, knives, and from one to four braces of pistols each." Their design was to pass the river and take possession of Jackson county -- the "Zion" as they term it, of their faith. Their leader, the prophet Jo Smith, promised them to "raise again" all who should be slain in fighting the battles for the possession of this Holy Land. The Jackson county people were equally determined to resist the passage of the river, at all hazards. -- A letter from a person on the spot, published in Maysville, Ky., says that Jackson County raised 900 and Lafayette 400, and that several hundred more were ready to come at a moment's warning. The feeling of the people may be conjectured from the expression of opinion in the letters quoted, that had the Mormons attempted to cross the river, not one of them would have been "left to tell the tale." "No quarter would have been given, and we could have killed most of them before they got across the river." -- There were some attempts at negotiation. The Jackson county people offered to buy all the lands of the Mormons at a double price, which was refused. The invaders professed reasonable intentions, and a desire only to take quiet possession of their own lands -- professions which appear to have got no credit. In the end, however, they desisted from the enterprise, and postponed the crusade for the possession of their "Zion" for fifty or a hundred years. They will take up their intermediate residence somewhere else; and thus the battle, which must have been obstinate and very bloody, was avoided. It is to be hoped, for the sake of ordinary justice, that means will be found for making compensation to these deluded men for the property they are forced to abandon, as well as for the damages they have sustained by being driven out. Vol. XI. Palmyra, N. Y., Friday, August 22, 1834. No. 49. The undersigned has transferred his undivided half of this paper, and the printing establishment connected with it, to Mr. POMEROY TUCKER. This change he trusts and believes will be perfectly satisfactory to all his political friends. Mr. Tucker is a man of sound political principles, and of considerable experience as a writer; and is abundantly qualified for the station of editor of a public journal -- in which capicity he is already favorably known... T. R. STRONG. Mormonism. -- This doctrine is obtaining a foothold in New-Hampshire. A Mormon preacher has lately established a church in the village of Dover. Vol. XI. Palmyra, N. Y., Friday, August 29, 1834. No. 50. At a meeting of the Citizens of the town of Manchester, favorable to the present National and State Administrations, held in pursuance of public notice, at the house of Jacob Vanderhoof, 2d, in Coonsville, on Saturday the 16th day of August, 1834, for the purpose of choosing three delegates to represent said town in County Convention, to be held in Canandaigua on the 18th day of August instant: John Latting was called to the Chair, and Elijah Cole appointed Secretary. The following persons were appointed delegates: -- Julius N. Granger, John Latting and Elijah Cole. On motion, Resolved, that a Committee of six be appointed to draft resolutions expressive of the sense of this meeting: Lyman Cowdry, Dr. B. F. Post, Elijah Cole, Julius Granger, Jeremiah Nottingham and Combo D. Rice, were appointed said Committee. Note 2: If Lyman relocated to Manchester as early as 1833, he might have crossed paths with D.P. Hurlbut, who was in the Manchester area collecting anti-Mormon affidavits in November and December of 1833. On Jan. 13, 1835 Oliver Cowdery wrote to his brother Lyman Cowdery at Manchester, and said: "Hurlbut is now in this country pedling slanders, but has said nothing about myself as I have learned. If you were acquainted with his character, as represented to me, you would never regret that you did not open a communication with him." Oliver's words may indicate that D.P. Hurlbut attempted to communicate with Lyman Cowdery in 1834. Lyman was still living in Manchester, during April of 1836, since his brother Oliver made an entry in his "sketchbook," saying that he had received a "letter from my brother Lyman Cowdery, of Manchester, N.Y." Also, the 1911 Mehling Cowdrey... Genealogy records that Lyman's son, Lyman Emmet Cowdery, was born at Manchester on Feb. 18, 1836. Within a year or two, Lyman had moved to Kirtland, Ohio, where the Painesville Republican of Sept. 27, 1838 lists him, Oliver Harmon, and Oliver Granger" as members of the Kirtland "Vigilance Committee." Note 3: Anson Call's journal entry for Jan. 15, 1839 says: "Lyman Cowdery came to my house [at Far West, Missouri] and inquired after me, telling my wife he wished to see me that evening and he should like to meet me at W. W. Phelps." By 1841 Lyman had returned to Kirtland, from which place he wrote a letter to Gov. Thomas Reynolds of Missouri. Note 4: In 1881 Elder William Kelley interviewd William Bryant, an old resident of Manchester, who recalled: "I knew Cowdery; Lyman Cowdery, I believe, was his name. They lived next door to us." Vol. XII. Palmyra, N. Y., Friday, August 16, 1835. No. 46. Eastward the star of Mormon holds its way. -- a disciple of Joe Smith has announced his intention of giving lectures on Mormonism in Julian Hall, Boston. Vol. XII. Palmyra, N. Y., Friday, September 18, 1835. No. 51. The Mormonites have made some small progress in Rhode Island. They have a preacher in Providence, and quite a respectable number of members in the northern part of the state. We are requested to mention that Elder Oliver Granger, of Kirtland, Ohio, will preach at the Baptist Meeting House in this village, to-morrow evening. (Saturday, Sept. 19,) at early candle-lighting. Note: In a July 8, 1838 "revelation" Joseph Smith, Jr. says of Elder Oliver Granger: "his name shall be had in sacred remembrance from generation to generation, forever and ever, saith the Lord... let the blessings of my people be on him forever and ever." Granger's name has been largely forgotten since that time. Vol. XII. Palmyra, N. Y., Friday, September 25, 1835. No. 52. We last week got the impostor Matthias into an odd pickle -- preaching to the drunkards of Pennsylvania. It was a mistake of the printer. The Dunkers were the people meant -- a religious sect, resembling the Shakers somewhat in their tenets and customs. While alluding to the arch impostor, who has already received too much attention from the newspapers, we will mention the rumor that he is on his way to join the Mormons in Ohio. We don't believe he will suit them. Our opinion is that he is a greater knave than fool, and that they are vice versa. Note: Robert Matthews (1788-1841), alias Robert Matthias, (a.k.a. "Joshua the Jewish minister") was a religious fraud who went about the country claiming to be God in the body of the biblical Apostle Matthias. He traveled through Ohio during 1835, stopping at Kirtland to visit with Joseph Smith, Jr. on Nov. 9th of that year. Apparently word of this visit got back to editor James G. Bennett about the time he inserted this notice in the Herald. See the Painesville Telegraph of Nov. 20, 1835 for a brief report on Matthias' visit with Joseph Smith, Jr. at Kirtland. See also the New York Herald of Nov. 28, 1835, for a brief notice saying that Matthias did not join the Mormons during his stop at Kirtland. Vol. XIII. Palmyra, N. Y., Friday, April 1, 1836. No. 27. Vol. XIII. Palmyra, N. Y., Friday, June 17, 1836. No. 38. The Mormons. -- Three priests! belonging to this sect, passed through this village two days since. Who do you guess they were? You are familiar with the pedigree of two of them. -- They belong to old neighbor Smith, the money digger, father of JOE, the great Mormon prophet. We understand that the boys were on their way to Boston, to preach to the unenlightened! Bostonians. O tempora! O mores! Vol. XIII. Palmyra, N. Y., Friday, August 12, 1836. No. 46. MORMON MOVEMENTS. -- Missouri papers state that information had been received from Kirtland, Ohio, the head quarters of the Prophet, of a new movement among the Mormons to regain possession of their 'promised land' in Jackson county, Missouri; from which they were formerly driven by the inhabitants. They are said to be arming to the number of 1,600 or 2,000, and making their way towards the disputed ground. It is also stated that the people of Jackson are taking effective measures for resistance, and are determined to convince Joe Smith that he has been misinformed respecting the location of the 'New Jerusalem;' and that he had better call for a new revelation, informing him where the true site of the 'holy city' may be found. A considerable number of the deluded followers of the Prophet, have left their homes in Canada and entered upon a pilgrimage to the 'promised land' in obedience to the command of their leader. -- Black Rock Adv. Vol. XIII. Palmyra, N. Y., Friday, September 2, 1836. No. 49. THE MORMONITES . -- This fanatical sect is increasing so formidably in Missouri, as to alarm all the rest of the citizens of the state. Their great influx from Ohio and Illinois into Missouri has lately called forth several public meetings in the latter state, to arrest their influence, more particularly over the Indians on the frontier. -- Proclaiming themselves the friends of the red men, and teaching them both by argument and by prophecy, that they are destined by Heaven to inherit the land of their fathers in common with the white race, they are believed to have secured the zealous friendship of many powerful tribes. The committee of public meeting lately held at Liberty, Clay co., Missouri, stated that the Mormonites were popularly charged with keeping up a constant communication with the frontier tribes, which the settlers were apprehensive might lead to sanguinary Indian outrages in the south, or at least to a civil war between these bold fanatics and the old settlers. Vol. VIII. Lyons, N. Y., Wed., October 11, 1837. No. 3. From the New York Star. The discoveries in Mexico, Central and South America, and indeed throughout the far west, are daily convincing the reflecting portion of our citizens, that what is called the new world, that continent which we have every reason to believe was first discovered a few hundred years ago, is in fact coeval with the old world, and has been peopled by a race of great and warlike men from the East, who built splendid cities, cherished the arts, and who, like those of Greece and Rome, had also their rise, progress and downfall. -- We have however, the history of the old world, authenticated from the earliest period. We have still in existence the monuments of art referred to by historians more than three thousand years ago. In America, however, we [have] [the] splendid works of antiquity -- the Pyramids and Temples -- the symbols of Egypt and Persia -- the broken columns -- hieroglyphs and Metopes -- the ancient military roads and military stations, [but] their history remains yet to be written -- [the] hands that reared them, the nations that inhabited them, and the period of their erection are yet to be discovered by our countrymen, and we cannot doubt in reference to the spirit and enterprise, the genius and perserverance of Americans, that we shall yet have amongst us our Bruces, Neiburs, Bukardts, Champollions &c.
It is now several years since our attention was directed to this subject, from reading a correspondence which had taken place between Dr. Corroy, of Tobasco, and Dr. Mitchell, of this city, which was subsequently kept up by Dr. Ackerly, who prepared and read a very interesting paper on American Antiquities before the Lyceum of Natural History in 1833. Dr. Corroy has been for many years engaged in making researches among the ruins of that famous city of Palenque, in collecting materials for history and forming a museum of [idols], symbolic sculpture, papyrus, &c. Del Rio in referring to the antiquities called by the Spaniards Casas Piedras, or stone houses, speaks of an extraordinary ruin in Yucatan, 20 leagues south of the city of Medida. "One of these," says Del Rio, "a large building, has withstood the ravages of time, and still exists in good preservation. -- The natives give it the name of Oxmutal. It stands on an eminence of twenty yards in height, and measures two hundred yards on each facade. The apartments, the exterior corridor, the pillars with figures in medio relievo, and decorated with serpents, lizards, etc. formed in stucco. Beside these there are statues with men with palms in their hands, in the act of beating drums and dancing, resemble in every respect those observable in the buildings of Palenque." Del Rio was a Spanish Captain of Artillery, who as far back as 1780 visited Central America, and made the most interesting discoveries. of ancient temples, aqueducts, statues, hieroglyphics &c., drawings of the which he made, which together with his report to the Spanish Government, [from various] and suspicious motives were concealed from the world until the Mexican revolution, when Signor Cabrera discovered the papers, and pursued the enquiries. It is Cabrera's opinion, and there seems to be no doubt of its accuracy, that these extraordinary temples and palaces had their origin from the Carthaginians -- that they visited America before the Christian Era, and that the first colony sent to America by them was previous to the first Punic war which commenced in the 190th year of Rome, and the 264th year before Christ, and that they established the Kingdom of Anuahac at some period during the first Punic war. Professor Rafinesque has long been engaged in pursuing his enquiry, and in his works contends, that there were negroes in America before the discovery by Columbus. His researches, together with [W-------], Dr. Corroy and others, promise the most interesting results. Our object at present is to call the attention of the Library Committee of Congress to the fact that Lord Kingsborough has published a splendid work on the ruins of Central America, Mexico and Peru, and particularly the ruins known as Tultucan, principally Pyramids, Aqueducts, Viaducts and Temples. The cost of this great work is a little beyond the ordinary means of private individuals, about 600 dollars, but it is of the first importance that Congress should have a copy in the Library, and indeed, if possible to authorize a proper commission to institute enquiries into these extraordinary reliques of antiquity, found in a country supposed to have been discovered a few hundred years, it will not be long before Mexico and Central America will be visited by travellers with as much avidity as Egypt, Turkey, and Greece. Vol. XV. Palmyra, N. Y., Friday, August 17, 1838. No. 47. THE MORMONS. -- It is stated in the Canton, Ohio, Repository, that this people to the number of about 200, with 57 waggons filled with furniture, cattle, &c. have left Geauga, on their way to the "promised land" in Missouri. They pitch their tent in the open field at night after the manner of the ancient Israelites. Vol. VIII. Lyons, N. Y., Wed., Sep. 26, 1838. No. 52. MORMONITES. -- A number of the citizens of Missouri, not long ago, raised a considerable force for the purpose of driving the Mormonites out of the State. They marched with all the "pomp and circumstance of war" towards the Mormon settlement, but happened to learn on the way that their opponents, well armed with swords, pistols, guns and blunderbusses, were prepared to give them a hot reception, they wheeled to the right about and fled like sheep in a panic. The Mormonites have precious little of the Quaker about them. They trust quite as much to the "arm of flesh" as to the "sword of the spirit." -- Louisville Journal. Vol. IX. Lyons, N. Y., Wed., Oct. 31, 1838. No. 5. Mormon War Renewed -- Blood shed. -- In the Louisville Journal of October 16th, we have later news from the Mormons, and despatches to governor Boggs at St. Louis. Several hundred of these, armed, are encamped at a new rendezvous, called Dewitt, *Mo.,) a few miles above the mouth of Grand River. A body of armed citizens, with a field piece, were near them, and several skirmishes had taken place, in which two or three were wounded. The citizens, or rather mob, are under a Dr. Austin of Connecticut, and a Colonel Jones. They offered to pay the Mormons for their lands and ten percent interest, and transport their people out of the county. The Mormons said they would die first, and have since been so strengthened by a reinforcement from the main body at the "Far West," in Caldwell county, 70 miles distant, that the mob deferred making a general attack. Vol. IX. Lyons, N. Y., Wed., Nov. 21, 1838. No. 8. Correspondence of the New York Daily Express. LATER AND MORE DREADFUL NEWS. The simultaneous tolling of the bells aroused us from our pillows, last night to hear the rehersal of the most barbarous atrocities. -- The following letters which were read before the meeting, which speedily assembled in the court house, embody the principal facts, as succinctly, perhaps, as any language which we could substitute -- and we hence submit them without further comment than that the authors are gentlemen of the first respectability. The meeting last night adjourned to meet again at 9 this morning, for the purpose of organizing, and marching this evening or to-morrow. Col. JONES, Sir -- News has just reached us here that the Mormons have attacked and cut to pieces Capt. Bogard's company of 50 men, except 3 or 4 who had escaped. They say the Mormon force is 300 or 400. Richmond is threatened to-night. If you can spare, I wish you to detail two or three companies of troops, and repair to Richmond will all speed. Gentlemen. -- News of an appalling nature has just reached us. Capt. Bogard, who was ordered with his company to guard the frontier of Ray county, was attacked and cut to pieces by immense numbers. They were overpowered by 300 or 400 Mormons, while they were guarding their own frontier. But 5 minutes ago, three reports of a cannon were heard in the direction of Richmond. The news of their burning and pillage has already reached you. They have indubitably captured the cannon, and taken many prisoners -- probably killed many. Daviess county is a scene of desolation. Ray is probably so ere this time; and their next movement will be at this place. It is already threatened. Be up and doing. Bring all the men you can, and let us check them in their course of destruction and devastation. -- They are moving on with great strides to the climax of anarchy, civil war, and desolation. -- Wolf and Baker will explain all. I have just received orders, by express, from brig, gen. Parks, to raise 150 mounted men. Fifty have volunteered, and the remainder I will obtain in a day or two. Stir the people up in Howard and Chariton. Send all the braves you can with Wolf, and we can meet and check them in their mad career. To Congrave Jackson, and others. From the N. Y. Eve Star. "That prior to the above events the Mormons held councils every day in the Far West. On Sarurday last, they resolved to carry out Sidney Rigdon's 4th of July speech in warfare, viz: Extermination, root and branch. Also, every man in Caldwell able to bear arms, who yet persisted against joining them in the battle and spoils, that their lands should be confiscated, their firesides occupied by better people, and their blood should stain the earth. "There is a party, whose business it is to pillage, secure, burn and destroy property. They say they are headed by an angel called the 'Destroying Angel.' We believe there are few citizens, if any, in Daviess county at this time. "And as to murdering the citizens, they had previously threatened the lives of many, and now they have put many of their enemies out of way of the latter day saints. "They can no longer bear any other name than a band of robbers and incendiaries, under the direction of about 20 heads." Vol. XVI. Palmyra, N. Y., Friday, November 23, 1838. No. 9. The Mormons. -- These deluded people [have] embroiled themselves in new difficulties. They have attacked and cut to pieces Capt. Bogard's company of 50 men, except three or four who escaped. They are represented as three or four hundred strong -- and in their infatuated [state] they fear nothing. The whole of Daviess county, Missouri, is represented as being desolate and the inhabitants of adjoining counties [are in a state] of commotion. The whole [------- will] probably fall victims to their fanaticism, before peace can be restored. Vol. XVI. Palmyra, N. Y., Friday, November 30, 1838. No. 10. Vol. IX. Lyons, N. Y., Wed., Nov. 28, 1838. No. 9. From the Missouri Daily Argus. "ELK HORN, Oct. 30, 1838. "On Thuesday, the 25th instant, about the dawn of day, a party of Mormons, about 200 strong, attacked Capt. Bogart's company, consisting of about 40 men, on the line dividing Ray and Caldwell counties. On the approach of the Mormons, the sentry fired and gave the alarm. The former advanced within 35 paces, formed a line, and received orders 'in the name of Lazarus, the Apostles, and Jesus Christ our Lord, to fire;' which was followed by a simultaneous charge, accompanied by demoniac and hideous yells of 'fight for liberty! -- charge, boys! -- charge! -- Kill the d--d rascals,' &c. Bogart, at the head of his gallant band, levelled his gun and echoed the command, -- 'Boys, let them have it!' The struggle was short and desperate. The Mormons were armed with one gun, two long pistols, a butcher's knife, &c., and rushed to the charge, in which many of the men came in collision with them and parried their swords, &c., with their guns, and knocked them down. They pursued the charge about 600 yards. Our loss was one killed and three wounded; two of the latter were left for dead on the ground. The loss of the Mormons was 19 or 20 killed and wounded; five or six of the latter are yet living. They took one prisoner, carried him to within three miles of Far West, where they had him put to death. 'The country is in the highest state of excitement; there are about 2500 troops within a day's march of Far West. They are pouring in from all quarters, and we expect, in a day or two, that that town will be laid waste. We are looking for the Governor with more troops. I have this moment been informed that the Mormons are making every preparation for a general battle. In the engagement on the 25th they took about $4,500 worth of horses, &c."
NS. Vol. II. Bath, N. Y., Wed., Nov. 28, 1838. No. 15. The St. Louis papers of the 8th instant, state that the Mormon war had ended, by the surrender of the leaders of the Mormons. On the 28th ult. about three thousand men. commanded by Gen. Atchison, of Clay Co., made their appearance before the town of Far West, the county seat of Caldwell county, where the Mormons were entrenched. Upon their approach the Mormons hoisted a white flag, which was shot down by Capt. Bogard, but was immediately replaced. Gen. Atchinson then sent in a message, with a view to learn their wishes and intentions, when six of the leaders avowed their willingness to surrender, in the expectation that the Mormons should be unharmed. -- The surrender was accepted, and the individuals put under guard. Their names are Joseph Smith, Sidney Rigdon, George Hinkle, Lyman Wight, Parley P. Pratt, and M. Knight. The Mormons assembled at Far West comprise 700 men under arms. Of this number, a small body of 150, retreated and pushed their way to the northern frontier. On the day after, the order of Gov. Boggs, directing the expulsion or extermination of the Mormons, was received by Gen. Atchinson; disgusted with such a command, he immediately resigned his office and retired. Subsequent to this, it is reported that a number of the Mormons were set upon and murdered. From the accounts which are now received, it appears to us that the poor deluded Mormons are more "sinned against than sinning" in the matter of this war, and that their great error was in settling down on some of the richest lands of the State, and that in the defence of their right to them, against the avarice of others, they were forced to take up arms. Vol. IX. Lyons, N. Y., Wed., Dec. 5, 1838. No. 10. From the St. Louis Republican. The western mail, yesterday, brought us some additional particulars in regard to the disturbance in Caldwell County. The Far West, published at Liberty, states that Gen. Clark still remained at the town of Far West, having under his command 1300 men, who were employed in guarding the captured Mormons. The General had despatched an order to Gen. Lucas commanding him to return Jo and Hiram Smith, Rigdon, Wright, Robinson and Hunt, for trial in Richmond, Ray County. Gen. Lucas was on his way to Jackson county and refused to obey his orders. A great many of the Mormons had made their escape from Caldwell county, leaving their families. Just as our paper was going to press, we received a communication from Gen. Lucas giving the stipulations of the treaty made by him and the Mormons. It will be recollected that we stated that Gen. Achison and his staff returned home, having considered himself virtually ordered from the field by Gen. Boggs; who assigned the command to Gen. Clark of Howard county. Gen. Lucas was in command of the troops previous to and at the time of the surrender of the Mormons. -- The matter was entirely settled before the arrival of Gen. Clark. What motive could have operated on Gov. Boggs for excluding Gen. Atchison from any command, we do not pretend to know, but this we do know, that he has done himself very little credit, by so illiberal a procedure. Gen. Lucas states that the officers and men under his command conducted themselves in a manner that will ever recommend them to his highest approbation. We are sorry that our space and time will not permit us to make any further remarks. The following are the stipulations between the parties: 1st. To give up their leaders to be tried and punished. 2d. To make an appropriation of the peoperty of all who had taken up arms, for the payment of the debt, and as indemnity for damages done by them. 3d. That the Mormons should all leave the state and be protected out by the militia; but to remain under protection, until further orders from the Commander-in-Chief. 4th. To give up all arms of every discription, to be receipted for. "For the purpose of arranging everything in a proper and legal way, Gen. Lucas left Col. Williams aid-de-camp to the commander in chief, Col. Burch and Maj. A. Ries of Ray county, to attend to drawing, writing &c. with a company of men to execute all orders consistent with the stipulations. Judge Cameron of Clay county, William Collins of Jackson, George Woodward of Ray, John Carroll and W. W. Phelps of Far West, were appointed by Gen. Lucas and Col. Hinkle, the commander of the Mormons, to attend to the adjusting of all claims, &c."
"There will be a dinner given to Gen. Achison on Monday next at the Liberty Hotel, as a tribute of the high regard and esteem entertained for his personal character, and his meritorious and prudent course in the late difficulties with the Mormons. The citizens of this, and the surrounding counties are respectfully invited." "The course of Gov. Buggs, in superseding Gen. Achison, we hear much complained about. Why the Governor did this we are at a loss to know. So far as we have heard an expression of opinion, the people appear to be satisfied with Mr. A. as a General." Vol. XVI. Palmyra, N. Y., Friday, April 26, 1839. No. 30. "The Mormons are still in confinement -- Joe Smith and the rest of the leaders, with the exception of Sidney Rigdon. He was liberated on giving bail, and as might have been expected, immediately took flight to Illinois. Whether the bird will return to its cage or no is uncertain, though in all probability we shall not see Sidney Rigdon on the west side of the Mississippi again. His companions in durance are treated with humanity and every kindness suitable to their condition. -- St. Louis Republican. Vol. XVI. - No. 31. Palmyra, N. Y., May 3, 1839. Whole 813. More than 30 years since, what now constitutes the historical part of the Mormon Bible, was written by one Solomon Spaulding. At a very early age, Spaulding obtained the appellation of a close student from his acquaintances in Ashford, Conn. his native town. After the completion of his collegian course at Hanover, N. H. he was engaged in the ministry. He abandoned this profession in three years, removed to Cherry Valley, N. Y., and commenced the mercantile business. Being unfortunate he again removed, and built a forge in the state of Ohio. He was soon reduced to great poverty and commenced writing a book, with the expectation, or hope that the sale of it might enable him to pay his debts. The work was called 'The Manuscript Found,' and contained the fictitious history of the Aborigines of America, whom he proved to be descendants of the Jews. This narrative commenced with Lehi, who lived during the reign of Zedekiah, 600 years before Christ. This Lehi was warned by God to escape the calamities that were to befall Jerusalem. He, therefore, left the doomed city with his family, and fled to the wilderness. In a short time they embarked on board a small vessel on the Red Sea, and floating to the ocean, after some length of time reached America, and landed on the shores of Darien. -- His descendants became in a high degree civilized, but were again reduced to barbarism by the numerous wars in which they were engaged. This accounted for the mounds and fortifications found in the western states, and for the condition of the Indians at the time our fore-fathers landed. When the work was completed, Spaulding was unable to raise funds sufficient for its publication. Soon after he removed to Pennsylvania, where he died. By some means, the manuscript fell into the hands of Joe Smith, jr. the originator of Mormonism. The father of Smith emigrated from Royalton, Vt. in 1820, and settled in Manchester, N. Y. At this time the son was only 16 years of age. This family were remarkable for their belief in evil omens, and like things. Collecting some few of his companions, the prophet was engaged in seeking hidden treasures. In 1825, it was reported by the friends of young Joseph, that he had been informed of certain gold plates, containing the history of the aborigines of America. Being opposed by an evil spirit, they were not obtained until 1827. These plates were written in characters which could not be read by any one excepting the prophet. The translation was not completed until 1830. In the mean time he removed to Pennsylvania, escaping the opposition of all evil-minded men. It was pretended that these plates were brought from Jerusalem by Lehi, and were transferred from father to son until the fifth century, when in obedience to the command of God, they were buried in the earth. The book of the prophet Joseph was received as soon as published by a few credulous persons. The reasons given for its belief were, the internal evidence of the book, and the striking exhibitions of the character of God through Joseph. Soon after the Mormon Bible was published, a set of fanatics from Ohio called Camp[b]ellites passed through New York and heard of the golded plates. -- They called upon Smith, and many of them were converted to his faith. -- With them, Sidney Bigelow, their preacher, was a man of eloquence and great popularity among them. -- National Aegis. Note. -- The same type which was used in printing the above article, was used in printing the Mormon Bible. -- Ed. 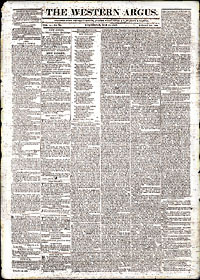 Note 1: The original, 1830 edition of the Book of Mormon was published on the press of the Wayne Sentinel in Palmyra, New York. It appears that the printer, nine years later, still had a few pieces of the earlier metal type left in the shop, to use in setting up this "Origin of Mormonism" article. Note 2: Some early journalists had a difficult time in getting Elder Sidney Rigdon's name written down correctly; previous reports -- emanating from the Palmyra area in 1831 -- called him "Henry Ringdon." Vol. IX. Geneva, Tuesday, June 4, 1839. No. 440. Vol. I. Seneca Falls, Tues., June 4, 1839. No. 1. The Mormon prisoners were taken from the jail in Clay county, where they have been confined since last fall, in Davies or Caldwell, for the purpose of having indictments found. This being done the change of venue to Boone county was granted, and they were immediately put under the charge of a guard to be brought to the jail at Columbia. Vol. IX. Geneva, Tuesday, July 16, 1839. No. 446. Indian Mound. -- The St. Louis Bulletin states that a gentleman living about four miles from that city, removed a small mound immediately in front of his house, a few months ago, and found in it the skeletons of some two or three hundred Indians. The skeletons were close together, and from their broken bones and other attending circumstances, it seems probably that, at some remote period, a battle was fought there, and that these are the relics of those who fell in the fight. As an honor to their memories, the survivors threw over their bodies this immense heap of earth, and it is probable that nearly all of these mounds have originated in the same way. To our own knowledge bones of Ibdians have been found in several. Vol. IX. Geneva, Tuesday, Aug. 6, 1839. No. 449.